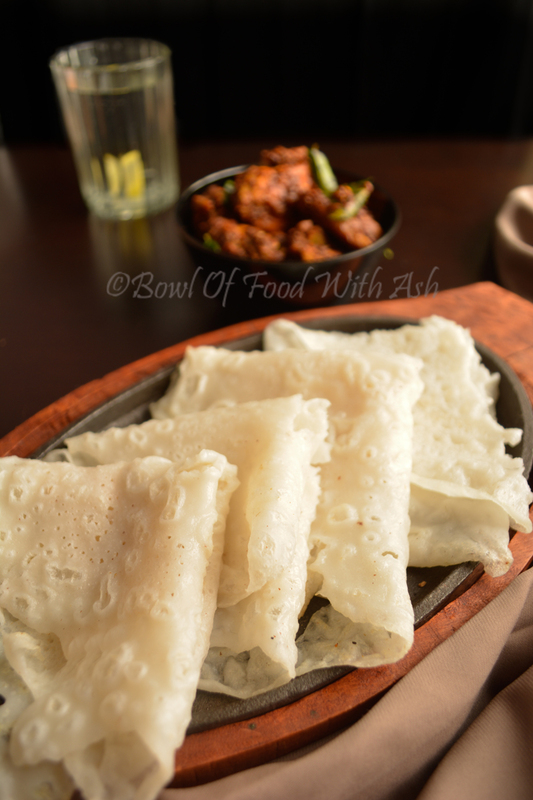 Neer Dosa is light, soft, lacey crepes made with rice with mild coconut flavour. In kannada Neeru means water.As the name of dish says, batter will be very thin , almost like water. We even call this dosa as kaayi dosa in my hometown since we make use of coconut (kaayi in kananda).Coconut is optional in this recipe. But I like the flavour when added. Neer Dosa is very popular in coastal karnataka. This goes very well with chicken curry using coconut(mangalore style). 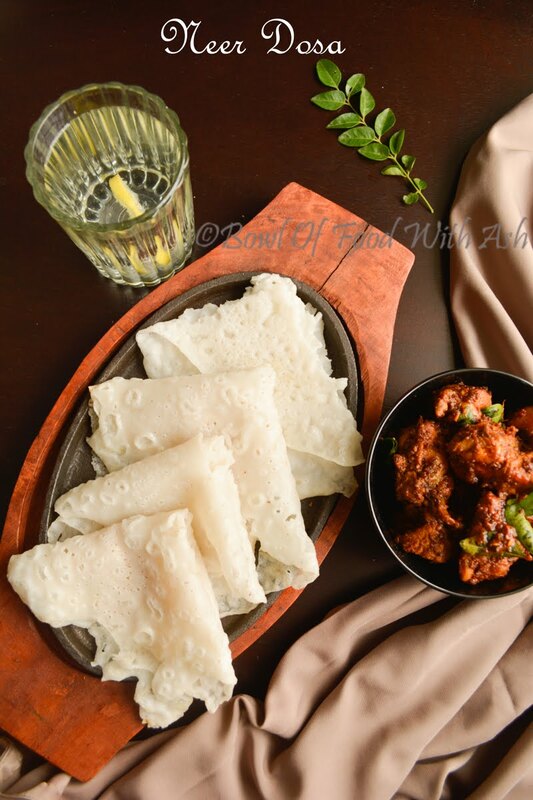 Recently I paired neer dosa with chicken ghee roast. You can even have with coconut chutney for breakfast. It goes well with almost all curries specially chicken gravies. I wanted to take step by step pictures of making this dosa.But could not , as I am busy with 4 month old daughter these days :).But making this dosa is very similar to Instant Rava Dosa.You can find the step by step picture here. 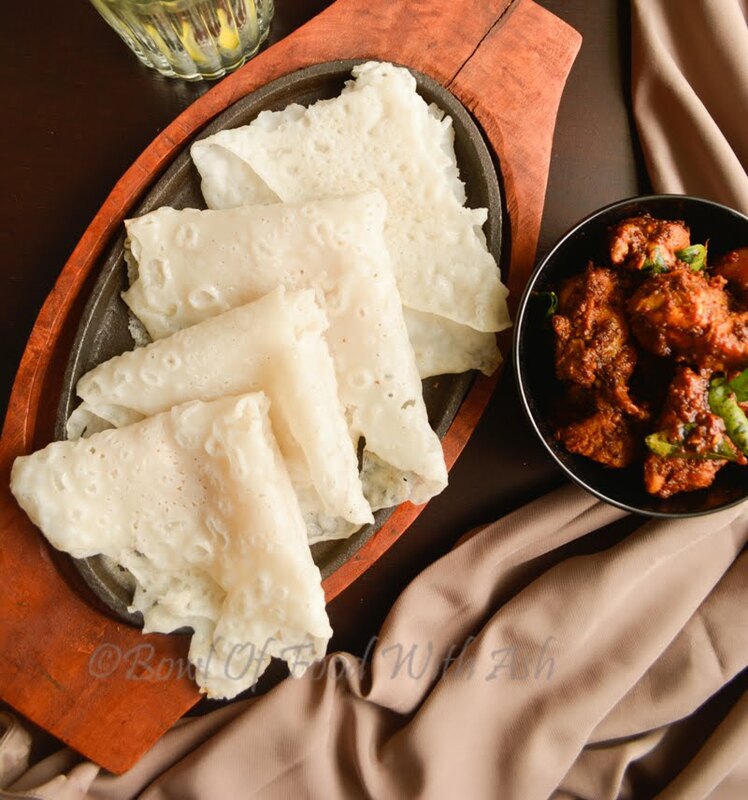 Do try neer dosa with any of your favourite curry and enjoy your weekend..
Find more Coastal Recipes here. Find More NonVeg Recipes here. 1.Soak the rice for at least 4 to 6 hours. 2.Drain the water and make a smooth batter by grinding Rice and grated Coconut by adding little water at a time. 3.Batter should be fine and smooth . 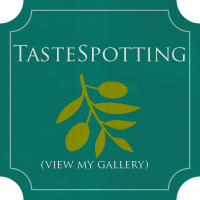 It should not have grainy texture when rubbed between fingers. 4.Batter should be thin (almost like a milk consistency). It should not coat the backside of spoon. 5.Add salt and mix well.No need to ferment the batter. 6.Heat the tawa on high flame. When you sprinkle drops of water, it should sizzle. it means it is ready. 7.Grease the tawa, Put on medium flame and mix the batter well and pour a laddle full of batter in circular motion from outside to inside. 8.Immediately swirl the skillet so that it fills up evenly. Do not spread using backside of laddle. 9.Drizzle few drops of oil if you are using iron tawa. No need to use if you are using non stick tawa. 10.Cook covered for a minute. 11.Remove lid and cook till the sides starts leaving the pan.Dosa will be in white colour . 12.Fold dosa into half and then to triangle. 13.Serve with chicken curry and enjoy. 1.Mix the batter everytime before pouring on the pan . 2.Don't stack hot dosas one above the other as it sticks to each other. Neer Dosa is called that because 'Neer' is a tulu word. Its not a kannada word. If it was kannada, it would be calle "Neeru" Dosa. Thanks for the information..I didnot mean,it is called due to kannada word Neeru.. Neer in tulu is nothing but water. I hope i am correct. Thanks. I meant batter consistency will be like water :)..anyways Will update the same..